Downtown Brooklyn's skyline will change dramatically in the next five years, a new CityRealty report said. BROOKLYN — Thousands of apartments in glassy high-rises are anticipated to take over the Brooklyn skyline over the next five years in the biggest construction boom in a decade, according to a new report. Some 22,000 new apartments in new developments are expected in Brooklyn by 2019 — with more than half of the units opening in high-rises in Downtown Brooklyn and on the Williamsburg and Greenpoint waterfront, according to research from real estate site CityRealty. Construction is expected to reach a 10-year high next year, with around 5,000 new apartments constructed, as well as another 6,000 by early 2017. Most of the units will be rentals, and virtually all of buildings will resemble the modern, glassy towers that are more typical of Manhattan than Brooklyn or Queens, said Gabby Warshawer, director of research and communications for CityRealty. "They’re going to have more high-rises than they ever did before, areas that were better known as brownstone areas or low, mid-rise areas," she said. "[Brooklyn's] going to be fairly dramatically altered." The report only looked at new developments with more than 20 apartments, in an effort to focus on larger properties. It also only looked at popular Brooklyn neighborhoods, including Williamsburg, Downtown Brooklyn, Fort Greene, Prospect Heights, Bed-Stuy, DUMBO, Park Slope, Boerum Hill and Red Hook. 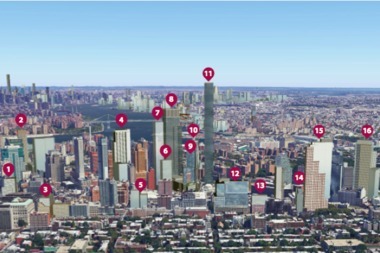 Rezoning in the mid-2000s paved the way for the skyscraper boom in Brooklyn, Warshawer said. Downtown Brooklyn alone is anticipated to build nearly 6,500 more new units in the next five years, more than any other neighborhood in the borough. The Williamsburg waterfront, which was also rezoned for high-density residential properties in 2005, represents the next major percentage of units, with nearly 4,350 new development units in large-scale buildings planned. Warshawer said the decade-high construction boom could be happening now, because the 2008 recession stalled many plans to capitalize on new zoning laws. Brooklyn has also become a more popular place to live, she added. "It seems like the economy has fully recovered, and developers have more access to capital funding streams," Warshawer said. "Interest has been rekindled." The bulk of the investment is going toward large-scale development projects like Greenpoint Landing and Pacific Park, in Prospect Heights, the report found. Greenpoint Landing will eventually consist of 10 buildings featuring 5,500 apartments, including roughly 1,400 affordable units. Development around Barclays Center and Pacific Park — formerly known as Atlantic Yards — is projected to bring 6,430 new units of housing to Prospect Heights. Other projects, like the Domino Sugar Factory development in South Williamsburg and new development planned for the former Rheingold Brewery site, also add to the high amount of new construction. Besides altering Brooklyn's skyline, the anticipated increase in density also impacts infrastructure needs in the borough, Warshawer said. Locals in Williamsburg and Greenpoint have been asking for improved transit for years, noting that trains like the L won't be able to handle the thousands of new residents who will be moving in. Existing residents also worry about how the influx of new residents will impact local schools, many of which are already at max capacity, Warshawer noted. Despite the strains that accompany increased density, the added units do help with New York's housing crunch, Warshawer said. "People need places to live," she said. "Even though it sounds like a large number, it’s pretty much a drop in the bucket."